"I want to honor you." Imagine a young person hearing you say these words. Imagine the positive impact it would have on their self-esteem to know someone cares. and resources for A/A and Hispanic student achievement in S.T.E.M. (Science, Technology, Engineering and Math). Your support at any level is a turn for the positive! "Get In Where You Fit In" and lets partner to make a difference in student achievement coast-to-coast. If you know of any organizations or groups that we can present this "Challenge" to, please advise. We have promotional materials available. Thank you for devoting your valuable time for the positive. "If we don't spend time with our youth, someone else will." The biggest gathering of selected high caliber African Diasporan will take place on Thursday, October 6, 2011, during the African Union Diaspora High Level meeting organized by the African Union Diaspora Task Team to aggressively pursue the concrete realization of the dream and mission indicated when the African Union created and recognized the African Diaspora as the 6th Region of the African continent. The meeting will be held at the Conference Hall of the African Union Permanent Observer Mission to the United Nations, 305 East 47th Street, 5th Floor, New York, NY 10017, between 8:30 a.m. to 4:30 p.m.
c) To brief and sensitive the African Diaspora on needs and developments within the AU system and obtain their inputs for assisting its growth and developments. According to the Chairman of the AU Diaspora Task Team, Dr. Chika Onyeani, the African Union Diaspora High Level meeting is aimed at bringing together a group of high caliber African Diasporan who have consistently empowered the aspirations and issues of the African Diaspora as well as the African continent in realizing the objectives African Diaspora as the 6th Region of the African continent. Many African Diaspora personalities have already accepted to attend and speak at the conference, including Ambassador Tete Antonio, Prof. Molefi Asante, Ambassador Ibrahim Gambari, Ambassador Dudley Thompson, Mayor Wayne Smith, Prof. Bereket Selassie, General Ishola Williams, Dr. Julius Garvey, M.D., Dr. Ron Daniels, Chief Tunde Olatunji, just to name a few, plus a high-powered delegation from the African Union Commission in Addis Ababa, Ethiopia. Dr. Chika A. Onyeani, Chair; Mr. Omowale Clay, 1st Vice Chair; Engr. Daniel Ochweri, 2nd Vice Chair; Dr. Georgina Falu, Secretary; Mr. Sidique Wai, Member; Ms. Dorothy Davis, Member; Ms. Miriam Omala Gauvin, AU Rep. The ProLibertad Freedom Campaign is asking folks to support these two events in NYC dedicated to the Cuban 5 and our brother Sekou Odinga! Support One of Cointelpro's Victims! COINTELPRO began in 1956 and continued through the 1960s and into the 1970s, focusing particularly on the Puerto Rican Independence, Black Liberation, Chicano Liberation and American Indian Movements. COINTELPRO racked up a number of assassinations, false imprisonments and ruined lives. No government official was ever punished for actions taken under the program’s auspices. The film by Freedom Archives details this history through the artful use of still photos and moving images of the period covered. Films of police attacks and protests; still photos of revolutionary leaders and police murders graphically remind the viewer of Washington’s willingness to do whatever it takes to maintain its control. Organizers who began their political activity during the time of Cointelpro discuss the effect the program had on them and the organizations and individuals they worked with. Indeed, several of the interviewees were themselves targets and spent years in prison (some under false accusations, as in the case of Geronimo ji-Jaga Pratt) or on the run. Former Black Panther member Kathleen Cleaver states toward the end of the film that COINTELPRO represented the efforts of a political police force making the decision as to what is allowed politically and what is not. Anything outside the parameters set by this force was fair game. Nothing that was done by government officials or private groups and individuals acting on the government’s behalf was perceived as wrong or illegal. As Attorney Bob Boyle makes clear in his final statement in the film, COINTELPRO is alive and well. The only difference now is that most of what was illegal for the government to do during COINTELPRO’s official existence is now legal. The PATRIOT Act and other laws associated with the creation of the Department of Homeland Security have insured this. COINTELPRO 101 is a well made and appealing primer on the history of the US police state. Produced, written and directed by individuals who have themselves been the target of tactics documented in the film, it has an authenticity and immediacy that pulls the viewer in. Although too short to cover the history in as full detail as some may desire, the film’s intelligence and conscientious presentation of the historical narrative makes it a film that the student, the citizen and the activist can all appreciate. Dinner will be Served for $5! NCOBRA will host a mass Reparations People’s Assembly to celebrate the growing Reparations movement, evaluate the last 20 years struggle for Reparations, and plan its next stages. All events will take place in Washington, DC, the city of NCOBRA's birth. This meeting is not just for N’COBRA members. Rather it is for all Reparations activists and supporters. In the spirit and practice of N’COBRA's Leadership Roundtable and The National Reparations Congress (2004), ALL organizations and individuals, past and present, working for Reparations for African descendants are invited. We will hear updates from Reparations national, local, and international leaders at Friday’s night National 20th Anniversary Rally. Saturday will be the time for Reparations leaders and workers to listen to the People. Every person will have an opportunity to share their views and recommendations. The Reparations Movement is entering a new stage and your views and work must be included. We encourage public discussions, led by the injured, to determine an equitable remedy for the African Holocaust of Enslavement. All African descendents have a right and responsibility to work towards defining and achieving Reparations. The opinions and actions reported on Reparations For Africans are those of the person(s) representing them and in no way should be viewed as N’COBRA’s unless clearly stated. On Thursday evening, October 6, 2011, the d'Zert Club and the IKG Cultural Center will present world renown authors and Egyptologists, Anthony "Tony" Browder and Dr. Robert Bauval. Tony Browder is an author and publisher, educational consultant, cultural historian and graphic artist and "symbologist". He is the designer of the famous "Egypt on the Potomac" Field Trip, which he has conducted for over 20 years. Tony Browder was explaining the significance of the design and symbolism in Washington, DC long before Dan Brown popularized it in his novel The Lost Symbol. Since 1987, he has led over 40 study tours to Egypt. 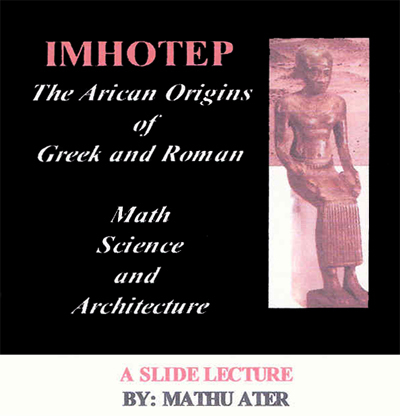 He is the author of From the Browder File and Contributions of the Nile Valley Civilization. Currently, Mr. Browder is leading and funding an excavation in Egypt, the first African American to do so. He has lectured extensively throughout the United States, Caribbean, Africa, Mexico, Japan and Europe, on topics pertaining to African and African American history and culture. Robert Bauval is an author, lecturer, and Ancient Egypt researcher. His most recent work, "Black Genesis: The Ancient Origins of Egypt", presents evidence that an advanced black African civilization inhabited the Sahara long before Pharaonic Egypt and reveals black Africa to be at the genesis of ancient civilization and the human story. Mr. Bauval has appeared on BBC, History Channel, National Geographic Channel, CNN, ABC, NBC, RAI 2 and several other European, Middle Eastern and Asian Channels. The lectures and book signings will take place from 5pm-9pm at the African American History Museum, 701 Arch Street, Philadelphia. Refreshments will be served. Admission is $10 per person. Proceeds benefit the ASA Restoration project which is funding the excavation in Egypt. For further information, please call 215-284-1926 or email dzertclub@aol.com. Click Image For Advocacy Week Schedule!! !